This entry will update you on some issues related to AGROVOC Thesaurus usability. The latest release of AGROVOC thesaurus can be accesses here. 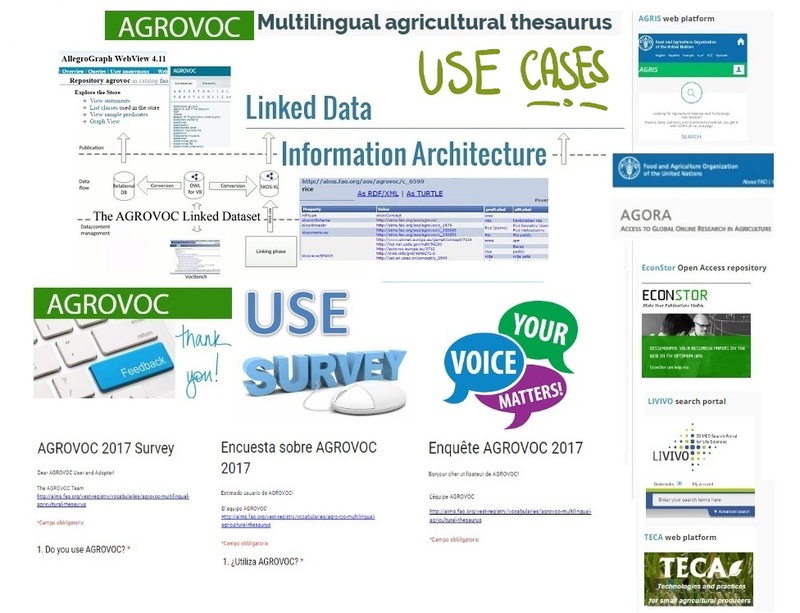 The AGROVOC multilingual thesaurus – maintained by FAO of the UN - is an online Linked Data (LD) resource used in different contexts and applications, from a number of perspectives and for a variety of purposes. The creation and update of AGROVOC content (from April 2017, with releases on a monthly basis) is possible thanks to a totally distributed environment managed by means of VocBench open source, able not only to provide a web-based, multilingual, collaborative editing environment, but also to link and to show all the AGROVOC data associated to a specific concept using several tabs. By accessing VocBench from different parts of the world, AGROVOC editors may interact (by contributing to the AGROVOC knowledge base) with one another, as well as with the AGROVOC team at FAO, who are responsible for AGROVOC content validity, quality, and publishing. To test: browse the Sandbox version of VocBench (when you log in, you would select agrovoc-test, for the sandbox). Suggest new AGROVOC terms [Editorial guidelines (English)]. To work with AGROVOC and, especially, with the English version of the thesaurus, one can use the AgroTagger. By re-training MAUI, one can use AgroTagger also in a different language. Learn more : AgroTagger : JAVA software to index your documents with AGROVOC thesaurus. The international AGROVOC Community of Practice is concerned with reaching as many interested users as possible while highlighting the developments, advantages and challenges of AGROVOC. To be constantly updated on ongoing (and to share specific) AGROVOC issues, you are invited to Join AGROVOC DGroups mailing list. This AGROVOC online community is intended to establish communications both in "personal” communication and via shared mailing list-type. What and Why Technology is important to push the development of AGROVOC Thesaurus? (interview with Andrea Turbati - from the University of Rome “Tor Vergata” - responsible for managing the maintenance of AGROVOC technical facilities). In the future AGROVOC will move to VochBench3 (VB3), though for the time being it is still maintained on VB2. AGROVOC thesaurus in the "Vocabulary Preservation" Section of the NISO TR-06-2017: "Issues in Vocabulary Management"
- just to name few relevant groups of AGROVOC uses. ... has been indexed in BARTOC.org (Basel Register of Thesauri, Ontologies & Classifications) and AGROPORTAL. … the implementation and use of AGROVOC thesaurus ? If so, please share your knowledge by contacting AGROVOC team at: agrovoc@fao.org. The AGROVOC team will continue to expand the inventory of AGROVOC good practices (including different experiences of AGROVOC uses) worldwide and, - consequently - inform you about them via the AIMS portal. Your voice matters and will benefit AGROVOC international community of practice in a variety of ways ! AIMS Newsletter no.66, September 2017 (Focus on AGROVOC within the context of a knowledge management strategy of the Food and Agriculture Organization of the United Nations, FAO).